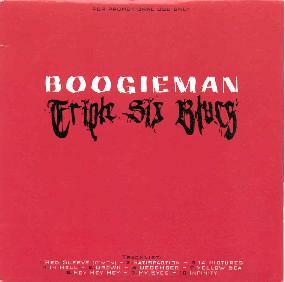 Boogieman - "Triple Six Blues"
This Swedish band have been around for a couple of years and released a 5 track EP in 500 copies previous to this CD, which includes all those tracks from the EP as well as 5 new tracks. The music is very rawly produced heavy rock. Despite the title, very little blues influence is really heard. I really think that the vocalist Hellvis is best when he is not forcing his voice with the deep gruff sound. The vocals are just so forced and angry. He does some cool nearly almost spoken words. The opening track ("Red Sleeve") with its crushing foot stomping pace and angry vocals. "Satisfaction" is next and a good foot stomper and I like the short section of dual guitars. "14 Pictures" is an example of the melodic vocals of Hellvis before the forced, angry, metallic vocals take over. JJ Skat plays some really cool guitar tones throughout the CD. You can hear a little QOTSA influence on a few of the songs here but it is a much rawer sound. "In Hell" and "Drown" are angry songs. My favourite track on the CD was the last track, "Infinity". It is nearly twice as long as the next longest track on the CD at over 9 minutes but shows a totally different side of the band. Funny how the vocals and some of the lyrics are very similar to a Monster Magnet song (I saw my head explode on a TV show, I saw my mind go away.... ) The only track with the band experimenting with psychedelic rock. The song is a dedication to Monster Magnet in some ways. A pretty good debut. For more information you can visit the Boogieman web site at: http://www.boogieman.nu. Contact via snail mail c/o Jonas Johansson; Ostanvindsg 53; S-434 34 Kungsbacka; Sweden.